Gray and black brand new release Goplus Climbing and Stepper Machine is designed for the home gym or office use but has quite a robust build quality, a unique appearance, and a convenient foldable design. You can be certain you will enjoy a more efficient cardiovascular workout on this new two-in-one GoPlus Stepper with the twist action. The main focus is on all your lower body muscles and the lower, middle and upper abdominals. But you will actually be shaping your entire body as you will lose calories and fat quickly, especially if you follow a healthy diet. The black foam covered handlebars include the pulse sensors that are connected to the multi-function LCD display panel that includes the Count (number of steps), Total Count (T CNT), Calories burned, Elapsed Time, Scan, RPM, and Pulse. You have the three convenient buttons of Reset, Mode, and Set. This easy to read and operate panel makes it much easier for you to monitor your workout progress and to keep motivated. 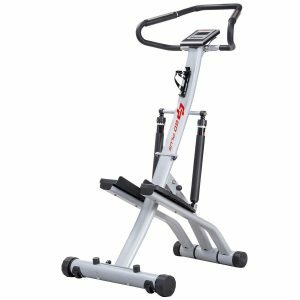 GoPlus Stepper has a simple vertical design, is both slim and lightweight and doesn’t take up much space in your gym area or living room. It weighs 45 pounds with the dimensions of 31.5 x 24 x 52 inches as assembled. There is a bottle holder for when you’re thirsty and you don’t need to dismount the stepper to get some water. Please note that a bottle is not included in the package. With its folding design and the wheels, it is quite easy to move to a convenient corner. You can simply lean it against a wall or put it under your bed or in the closet. As you can see in the photos it comes with the double heavy-duty hydraulic cylinders and twelve resistance settings that you can adjust easily via the damping adjuster on top of the cylinder. This is for increasing and decreasing the tempo and challenge during your exercise session. It can have a total user weight of up to 265 pounds with the heavy-duty solid iron frame- materials used on this unit are iron, PP, ABS. You will feel safe and stable on it thanks to the textured plates that will stop any slipping. Your hands will be holding onto the foam padded handles that offer you better balance and stability. You will find the stepper and an instructions manual in the box with very small graphs but is not very hard to put together. It has both the GS (Geprüfte Sicherheit) certification that indicates compliance to the German Product Safety Act and CE (Conformité Européene- European Conformity) approval for conformity with environmental protection, safety and health standards within the Euro Economic Area. As a budget-priced climber and stepper that would be suitable for both beginners and more advanced users. The stepping height is adjustable for people of different heights- tall and short people can use it comfortably. It is a decent basic step and climbing machine overall, as long as you don’t have very high expectations.